The opportunity to win new clients positions your homecare agency to serve more seniors, employ more members of the community and see an increase in revenue and profits. But when you’re in the throws of managing an already busy business, finding time to market to new clients can seem like a pipedream. However, with the proper business management strategies in place, you can have time to keep your current business ticking like a clock while you also put some focus into bringing on more clients. With the technology of a homecare software or homecare system, such as ClearCare Online, everyday business needs and customer relation management can be handled via one robust technology. When it comes to the necessary practices to keep a homecare agency running, there’s a multitude of “to-do’s” ranging from caregiver recruitment and scheduling to client communication and even payroll and billing to keep finances in order. While this all takes time, using a homecare software or homecare system, like ClearCare Online, to help automate some of these processes can greatly reduce time spent on things like notifying caregivers of upcoming shifts or processing billing. For example, ClearCare Online’s homecare system offers automated shift reminders via text or email everyday at 5 pm, so that caregivers have no question about where they need to be and when. Additionally, a secure caregiver portal within the homecare software allows caregivers to check their long range schedule as well as review the assessments of clients that they’re working with at any time. This helps you keep in better communication than ever with your caregivers, all while spending less time on the phone or in person communicating this vital, yet tedious information. 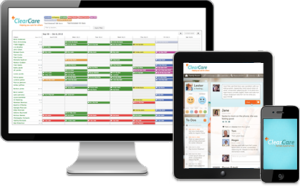 Beyond the capability to manage your business needs, the power of a homecare software like ClearCare Online also allows you to manage marketing and expansion efforts. For instance, Referral Sources and marketing activities can all be tracked in your homecare system. This allows you to keep in better touch with networking connections that can help bring you clients – and you can demo your use of ClearCare Online to them, proving your unique capability to manage care with great efficiency and care with the help of a homecare system. Beyond referral sources, ClearCare Online homecare software also gives you the power to manage potential clients with a Prospects section and easy-to-use tools that allow you to see what needs to be done to close new service. If you are looking for a better way to run your homecare agency, as well as realistic methods to expand, ClearCare Online’s homecare software offers a reliable, web-based solution as a partner in your business.